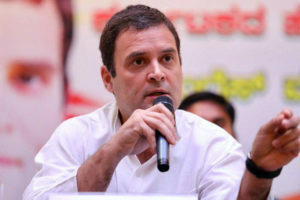 Congress party’s Working President Rahul Gandhi blasted Prime Minister Narendra Modi’s lackluster sops for the farmer’s community announced in the interim budget yesterday. In his budget speech, the Interim Finance Minister Piyush Goyal announced annual income support of Rs 6,000 to each farmer in the country. Rs 6,000 comes down to Rs 500 per month and less than Rs 17 per day. In a vehement attack, Rahul took to Twitter and tweeted, “Dear NoMo, 5 years of your incompetence and arrogance has destroyed the lives of our farmers. Giving them Rs. 17 a day is an insult to everything they stand and work for.” Rahul also added the hashtag #AakhriJumlaBudget. The Rs 6,000 annual financial aid to the farmers across India is brought under the scheme called PM-Kisan or “Pradhan Mantri Kisan Samman Nidhi.” The scheme would cost the exchequer a sum of Rs 75,000 crores annually. Farmers with less than 2 acres of land will be eligible for the cash aid. The money would be deposited directly to the farmer’s bank account in 3 installments of Rs 2,000 each. However, the Congress party and all the BJP opposition parties are terming the PM-Kisan scheme as BJP’s move to pacify the agitated farmer’s community in the country. It remains to be seen whether this new initiative will help the BJP in the 2019 general elections. Next articleKA Paul and Pawan Kalyan Alliance.? | Praja Shanti Party and Jansena Alliance..?